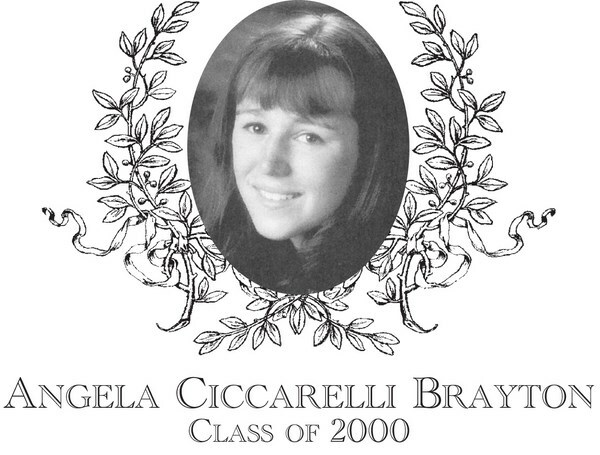 Angela Ciccarelli Brayton, Class of 2000, had a stellar six-year career in athletics at Bartlett, playing five different sports and lettering in all of them. Angela was a six year starter on the Varsity Soccer team, a four year starter on the Varsity Basketball squad, and played in 3 different sports during the spring: track in the 7th grade, Varsity Softball in her freshman and sophomore years, and Tennis in her junior and senior years. In the fall, as a seventh grader, she started on the State Finalist 1994 Girls� Soccer team, possibly the strongest Bartlett girls� soccer team of all-time. For the next five years, she continued to excel playing mostly mid-field while achieving Border Conference and SWCL All-star status 4 times and Central Mass All-star as a sophomore, junior, and senior. She captained the soccer teams in both her junior and senior years. In the winter, Angela played basketball, being elevated to the Varsity squad in her freshman year. Angela played point guard and was known for excellent passing, being a tenacious defender, and a great hustler. Besides being named a SWCL All-star, she had the distinction of being named a captain of the basketball team for her sophomore, junior and senior years. In the spring, Angela participated in 3 different sports. In the seventh grade, she lettered in track. As a freshman and a sophomore, she was the starting third baseman on the Varsity Softball team. As a junior and a senior,Angela made the switch to tennis, playing first doubles and on occasion, singles on the highly successful District-bound squads, accumulating a 4-1 record in singles and a 28-2 record in doubles. Over these years, she was matched with various partners, with Lisa Buzanoski being her primary partner; that combination advanced deep into the Individual Tennis Districts. Angela was named a SWCLAll-Star in tennis as a junior and senior. In her outstanding career at Bartlett, Angela lettered 14 times and achieved All-Star status in three sports. She was named the Sigmund StrezleckiAward winner as the top female athlete her senior year. Also, Angela was recognized by the MIAA National Girls & Women Sports Day as a female with exceptional athletic and academic skills. Angela was a High Honor student and a member of the National Honor Society. Angela and her husband, Michael, reside in Webster with their daughter Natalie.